The finals run of this tenth season of American Idol kicked off with five girls leaving the show in the first five weeks amid accusations that the public vote is naturally skewed to favour male contestants. 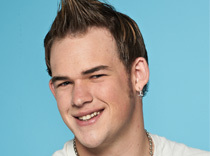 However, five weeks later, James Durbin became the fifth consecutive male to be voted off, meaning that two of the final three are girls for the first time since Jordin Sparks and Melinda Doolittle in season six. One of this year’s two surviving girls is Haley Reinhart, who has been named in the bottom three four times, including the first two weeks of the finals. Could she do the unthinkable and actually win? I’ll do a quick assessment of the relative merits of the final three after a quick recap of this week’s results show. As I have highlighted in previous recaps, the Idol results show always contains more padding than actual results, but this week’s at least made up for it by including some seriously big hitters to help fill in the time. We had live performances from Enrique Iglesias (whose new song is straight out of the book of Eurovision Song Contest clichés) and a slimmed-down Jordin Sparks. There is recorded footage of Lady Gaga singing You and I, the as yet unreleased track performed by Haley last week. And Steven Tyler premieres the video for his (disappointing) new single. Thankfully, there is no excuse to roll out J-Lo for a third time this season. I guess she just isn’t a big enough star in the company of this week’s roll call. Tee hee. The second member of the top three – just to hammer home the point that it really isn’t all about the boys this season – is Haley. Which just leaves James and Scotty McCreery, and it’s Scotty who makes it through. James sings us out of the show, choking back tears. J-Lo stands to applaud him, choking back tears. Only one of them suffers the indignity of having their make-up streaked with tears, and it’s not Jen. Having originally condemned him as a ‘lite’ version of Adam Lambert, James had grown on me over the course of this season. He has been versatile in terms of his song choices, brings real energy and a live performance vibe every time he sets foot on stage, and has been the most consistent performer of all. At least he had been until these last two weeks, when a couple of mediocre track selections and performances let him down at a critical moment. But that’s Idol for you: it’s not about how well you start, it’s about how well you finish and the journey that takes you there. If the winner of Idol was solely about a contestant’s journey through the season – and if you don’t think it’s at all important, consider the progression of the last two winners, Lee DeWyze and Kris Allen – then Haley would be the odds-on favourite. There’s no question she is the surprise package of the final three, given that she was nearly eliminated in each of the first two weeks. And yet she has steadily improved throughout the competition, having had three genuine ‘moments’ – more than either Scotty or Lauren – Bennie and the Jets, House of the Rising Sun and this week’s I (Who Have Nothing). That, if nothing else, marks her out as a deserving almost-finalist. When she gets it right, her voice has rich tones and a seductive growl to it that really sets her apart. However, when she gets it wrong – and look no further than this week’s Earth Song or her awful rendition of Whitney Houston‘s I’m Your Baby Tonight – it’s easy to see why she has been at risk so often. It is that maddening inconsistency which will probably mean she will fall short of reaching the final, but make no mistake that she is fully worth her place in the final three next week. Way back at the start of the finals run, I predicted that Lauren and Scotty were the most likely finalists, and I see no reason to alter that view. Both have their strengths – preferring a genre (country) which has an enormous natural fan base doesn’t hurt, for starters – and their weaknesses, and although many have been forecasting a McCreery landslide for several weeks, I’m not so sure. For a 17-year old, Scotty has often looked the most professional and career-ready of all the contestants. He has a very strong voice, is comfortable and confident on stage, and has always been very clear about what kind of artist he wants to be – an old-fashioned, God-fearing, honest-to-goodness country singer. But that strength has also been his weakness, excluding a large proportion of non-country fans who would rather see anyone else win. And when he has (all too rarely) strayed outside his lane into other genres or stepping up-tempo, his performances have been far from convincing. I’ve had the feeling he has been cruising for a few weeks now, and his attempt at a comic rendition of Young Blood this week felt forced and phoned-in. Could Lauren upset the odds and win it all? Like Haley, Lauren has delighted and frustrated in equal measure. She has been more consistent, but while she has had fewer lowers she has also had fewer highs. And on a couple of occasions she has had the opportunity to reach up and grab those all-important ‘moments’ that viewers remember for weeks afterwards – most notably Candle In the Wind and Unchained Melody – but lacked the confidence to take that extra step and turn a very good performance into a special one. She has all the raw tools at her disposal – pitch, tone, power and expression, but like previous female winners Jordin Sparks and Carrie Underwood, she has never really convinced me that she can fully inhabit the emotion and personality of a song. That isn’t a fatal flaw, though – and while Scotty is the obvious choice to win, I still have a feeling that Lauren may ultimately come out on top. So, my prediction is that Haley will fall just short, and that Lauren will upset the odds and beat Scotty in the final. The judges have repeatedly refused to criticise Scotty even when he has turned in a poor performance (and there have been a few of those), but none of the top three is flawless by any means. And I suspect the voting is much closer in reality than many people imagine. It’s still all to play for. Next week will be interesting viewing, and do not be surprised if the underdog Haley has at least one more upset still within her. The contestants will perform three songs each – a personal choice, one selected by the judges, and then one from Interscope’s Jimmy Iovine. It often becomes crystal clear at this point – assuming it isn’t already – who the judges really want to win. If that’s the case, expect Haley to be thrown at least one hospital pass and receive a deluge of critical comments as a result. Posted in American Idol, Entertainment, TV & film, US series and tagged American Idol, Haley Reinhart, James Durbin, Jennifer Lopez, Lauren Alaina, Randy Jackson, review, Ryan Seacrest, Scotty McCreery, Steven Tyler, TV. Bookmark the permalink.